10:00 AM: Leave your Seattle Southside hotel and take a 15-minute drive down to Des Moines. 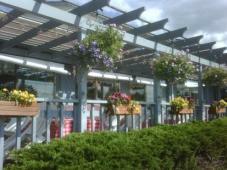 10:20 AM: Enjoy a delicious breakfast at Tuscany at Des Moines Creek, which sits near the water, for a peaceful environment. 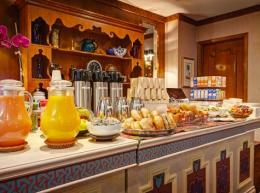 Indulge in a traditional, full-style, country breakfast or order a breakfast dish originated from Italy or Greece! 11:00 AM: Stroll along the Des Moines Marina and Beach Park after your breakfast and take in the breathtaking waterfront view, while walking down the boardwalk where you’ll see the early fishers and listen to the sounds of the water folding over each wave. Along Marine View Drive, visit shops where you can take home souvenirs and local artist’s work. 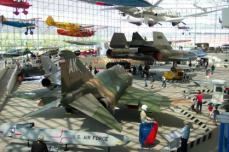 12:00 PM: Take a 20-minute drive down to the Museum of Flight where you will be exploring the world of aviation and its history. 12:20 PM: Arrive at the Museum of Flight where you will experience the magic of the galaxy at one of the largest air and space museums in the world. You’ll tour the original Air Force One, train to be an astronaut, and explore the history of flight. Take time to explore many of the other exhibits and simulators where you will put yourself into the world of flight! 2:30 PM: Grab lunch at Wing’s Café at the Museum of Flight after you’re done with your explorations and take in the view of Boeing Field while you enjoy a variety of lunch options ranging from snacks to hot entrees. If it’s nice outside, sit out on the deck to observe the sights and sounds of the nearby airfield. 3:15 PM: Drive down to Tukwila, where you will enjoy many attractions including indoor skydiving, shopping, dining, and entertainment. 3:30 PM: Arrive at iFLY Indoor Skydiving in Tukwila. iFLY is an indoor skydiving facility where you can experience first-hand the rush of skydiving without having to go above-and-beyond by jumping out of an airplane! This vertical wind tunnel allows you to fly with a professional at wind speeds up to 220mph! You’ll be floating up in the air and feeling the adrenaline rush in no time! The best part? No experience necessary! 5:30 PM: After your extremely adventurous experience at iFLY, take some time to relax at Westfield Southcenter Mall to go shopping. 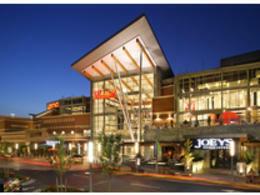 Westfield Southcenter offers more than 240 specialty retailers ranging from departments stores such as Nordstrom to popular retailers like lululemon and the Disney Store, making it the largest indoor shopping center in the Pacific Northwest. 7:30 PM: After spending some time shopping, you may want to grab some dinner and Westfield Southcenter is the perfect place to do so! 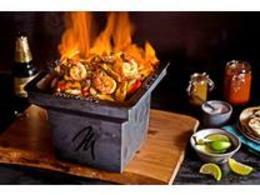 Head over to Moctezuma’s Mexican Restaurant & Tequila Bar located right outside the Mall on Lupine Walk. Moctezuma’s offers warm hospitality and authentic flavors of Mexican cuisine with a fully stocked tequila bar serving over 100 distinguished tequilas! 9:00 PM: After dinner, head back to your Seattle Southside hotel, and get some rest for what’s coming in your next day on your vacation. 9:00 AM: Wake up and enjoy a hot, filling breakfast at your hotel. Take advantage of the buffet that offers freshly-cooked eggs, warm coffee, perfectly toasted breads and juices that will give you energy for the long, exciting day ahead of you. 10:00 AM: Head over to the entrance of your hotel lobby and await pick-up from your Tours Northwest guide to take you to a premier 3-hour Seattle City Tour. 11:00 AM: Your 3-hour Seattle City Tour will begin with Tours Northwest! 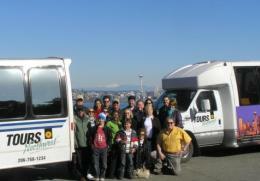 Tours Northwest specializes in informative and engaging small group tours. Sit back and relax in their spacious coaches as their guides bring you to all of Seattle’s must-see neighborhoods and attractions, while presenting you with knowledge of each and every area you visit. You’ll cover 50 miles of the city, so sit back and enjoy the ride! 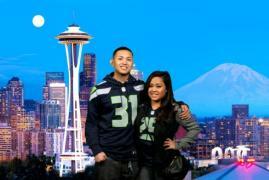 2:30 PM: After your tour, ask your driver to drop you off at the Space Needle so you can take a trip to the top! Once you get up there, enjoy the breathtaking 360-degree view of the whole city and areas surrounding! Grab lunch at the café at the top to keep you going, and don’t forget to take home your complimentary photos included with your admission, as well as some souvenirs to bring back from the shop at the bottom with all things Seattle. 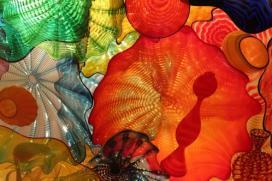 4:00 PM: With an option to purchase tickets in a package deal with the Space Needle, visit Chihuly’s Garden and Glass Museum located right at the bottom of the Space Needle. There are 8 glass galleries and three Drawing Walls, with a different mood and theme at each exhibit. A picture can be worth a thousand words, but the real thing will leave you speechless! 6:00 PM: Hop on the Seattle Center Monorail to the Westlake Center, and then transfer onto the Sound Transit Link Light Rail back to the Seattle-Tacoma International Airport Station. 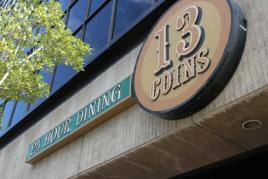 Walk down the street to 13 Coins for a nice dinner that you deserve after this long day! 7:00 PM: Grab some dinner at one of our area’s finest upscale diners. The menu offers more than 130 items varying from delicious benedict and other breakfast foods, to high-quality, juicy steak along with other fine dinner entries, available to order 7 days a week, 24 hours a day. This local restaurant is the type that you will run home and tell all of yours friends about. Don’t forget a glass of wine to go with your meal to celebrate your weekend so far! 9:00 PM: Head back to your Seattle Southside hotel and get some rest for the last of your weekend exploration. 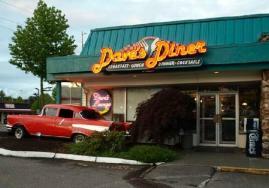 9:30 AM: Head over to Dave’s Diner located 5-minutes or less from your Seattle Southside hotel, and enjoy a home-cooked breakfast with large-portions that will leave you feeling ready to conquer your last day in town! Dave’s Diner will take you back in time with their 1950’s vibe and Route 66 décor. You’ll be spoiled with great food and service while you’re here, guaranteed! 10:30 AM: Once you’re done with breakfast, drive down to the Seattle Waterfront and get ready to dock, because you’re going on a cruise! Street parking is free on Sundays in Seattle, so head over early to claim your spot. 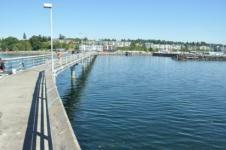 11:30 AM: You will be cruising straight off of Seattle’s Historic Waterfront. 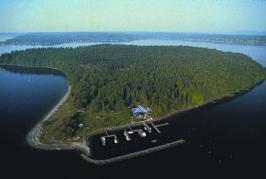 Board your cruise boat with Argosy Cruises and head over to Tillicum Village for a 4-hour excursion, located on Blake Island State Park, known to be home of Chief Sealth, whom the city of Seattle was named after. While sailing, you’ll be able to enjoy breathtaking views of the city and Puget Sound. Upon arrival, you will be greeted with steamed clams in nectar. Inside the longhouse you can watch as fresh salmon is cooked in traditional Northwest Coating. From there, you will be directed to the dining room where you will enjoy a full salmon buffet meal while you watch a live show that highlights the Coast Salish tribes. 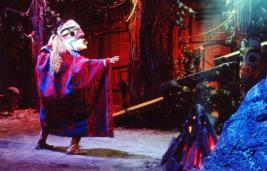 You’ll also get time to tour the island on your own. Make sure you bring traditional, native souvenirs home. 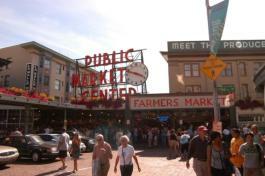 4:00 PM: Now that your cruise is over, head over to Pike Place Market which is a short-walk up from the Waterfront. The Market is known for the famous “Fish-Tossing”, original and first ever Starbucks, and many local restaurants and shops all packed into one area. The Market has nearly 300 commercial business people and dozens of street performers. It is a MUST-visit when you are in Seattle. 6:00 PM: Head back to your Seattle Southside hotel, start packing back up and get ready for dinner to finish off your whole, successful 3-day weekend. Once you’re all packed up and ready to eat, it’s time to get ready for your last dinner for the weekend. 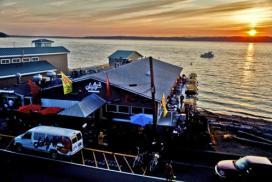 7:30 PM: Treat yourself to a relaxing and delicious dinner right on the waterfront at Salty’s at Redondo Beach Seafood Grill, just about 7 miles south from your Seattle Southside hotel. You’ll have fantastic views right off the Puget Sound while you enjoy award-winning Pacific Northwest cuisine, with entrees such as Blackened Halibut, Crab legs, Shrimp Linguine, and much more. Cheers to a great weekend and head back to the airport for your trip home.